Uttarakhand Medical Service Selection Board (UKMSSB), Dehradun has released notification for the recruitment of Assistant Professor in Government Medical College of Uttarakhand. Total No. of Posts is 138. The number of vacancy may increase or decrease. UKMSSB invites eligible candidates for Assistant Professor Posts. Candidates may apply online from 27 Sep to 24 Nov 2018 (Updated). Assistant Professor As per Latest MCI-TEQ Regulations-Min. Qualifications for teachers in Medical Institutions Regulations, 1998 (Amended up to 08 June 2017). (a) Served in Territorial Army for a min. of 02 years. Interested and Eligible candidates may apply online from the official website of UKMSSB i.e. www.ukmssb.org from 27 Sep to 24 Nov 2018 (Updated) till 11:59:59 pm. No other means/modes of application form will be accepted. Rs.2000 for General and OBC Candidates. The selection of candidates will be done on the basis of performance in the Interview test. Paper Publication- as First / Corresponding author As per MCI guidelines in Index Journal as First / Corresponding author for one publication-05 marks; for two publication-10 marks; for three publication-15 marks and max. 20 marks. Experience- After completion of one year of service, 05 marks for each completed year and max. 20 marks in MCI recognised or permitted college only). Experience will be counted after fulfilling the min. TEQ for Assistant Professor as per MCI. Experience Certificate issued by Director/Principal/Dean of MCI recognised / permitted institutions only, will be considered for evaluation.) 05 marks for each completed year and max. 20 marks. 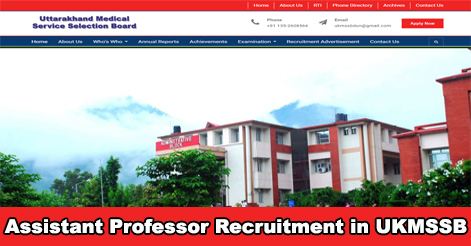 Help us to improve this article/job posting "138 Assistant Professor Recruitment in UKMSSB". We would be glad if you can comment below and provide your valuable suggestions and feedback. If this page have any wrong information/list or out of context content, then you can report us as well. any vacancies for food and nutrition subjects. For the post of medical engineering..